Quick firm shifting Automatic transmissions can’t be beat at the race track. But, the HOT transmission oil has to be COOLED to stay on track. 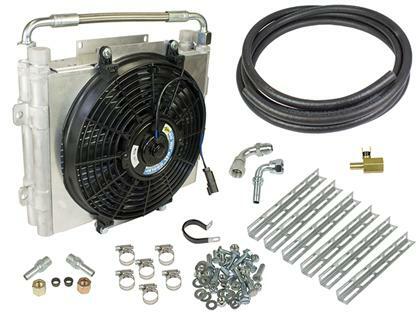 BD’s double stacked their proven Xtruded Trans Oil cores to deliver over 40,000 BTU/HR of cooling and over 350% temperature drop versus the factory system — 136% better temperature drop than BD’s standard single core kit. Using the same Micro Extruded bar technology as is in our air-to-air Charge Air Coolers, the 200 Micro Extruded passages in each cooler (400 total) provide a large surface area to transfer heat for external air flow cooling while turbulent oil flow design promotes a more complete cooling. Large 5/8-inch ports prevents inlet/outlet restriction and furnace brazed rails have been tested to 300psi of pressure. The thermostatically controlled 80-watt, 10-inch, 800 CFM electric fan offers ultimate automatic oil temperature control. Xtruded Double Stacked Transmission Oil Cooler packages are available to accommodate 1/2 and 5/8 transmission cooler lines and come complete with all fittings, clamps, hoses, hardware and a Build-It-Yourself galvanized bracket kit for quicker and cleaner installation — no wasting time fabricating brackets out of scrap metal. The pre-wired loomed harness with fuse and relay comes with OEM style sealed connectors to resist elements.